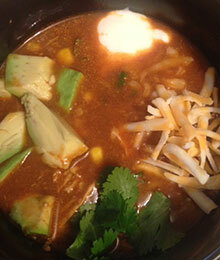 In cooker, mix broth, enchilada sauce and hot peppers. Place chicken into enchilada sauce mixture; spoon sauce over chicken. Cover; cook on Low heat setting 6 to 7 hours, or high 3 to 4 hours. Remove chicken from cooker with slotted spoon. Stir beans, bell peppers and corn into mixture in cooker. Cover; cook 5 to 10 minutes longer. Meanwhile, shred chicken by pulling apart with 2 forks; return to cooker. Cook until thoroughly heated. Add cilantro, stir and serve. If desired, top each serving with toppings of choice.